Ah, the wedding program. Do you really need one? Isn't it just one more thing to do, on what seems like an interminable list of pre- "I do" to-dos? Won't people get the general idea, and understand that they are gathered together, that day, to join together two people in matrimony? Well ... yes, it is one more thing to check off a list. And sure, sans program, guests would likely still be able to follow the action. But. BUT. They're really nice to have. Sometimes you've got everything settled, and the big day is choreographed down to the last Corinthians. Then you're in luck; you can order programs which list every last detail. Parklife Press handles complete programs, providing design services if needed. Programs are usually printed and delivered closer to the wedding date, to give the couple time to craft the ceremony and confirm all the participants — all you need to do is remember to bring them to the venue. But sometimes, those details are still being worked out. 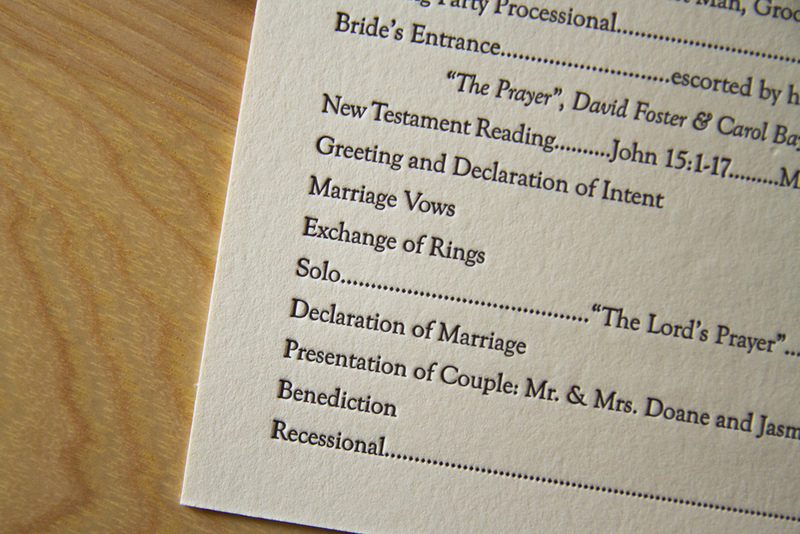 You're putting the final touches on it, it's this close to being finalized, but you and your betrothed need a bit more time to decide about whether the recessional song will be "Beautiful Day" or "Til There Was You." This brings us to the third, unofficial format: a semi-DIY option. Below are two letterpress program covers by Parklife. 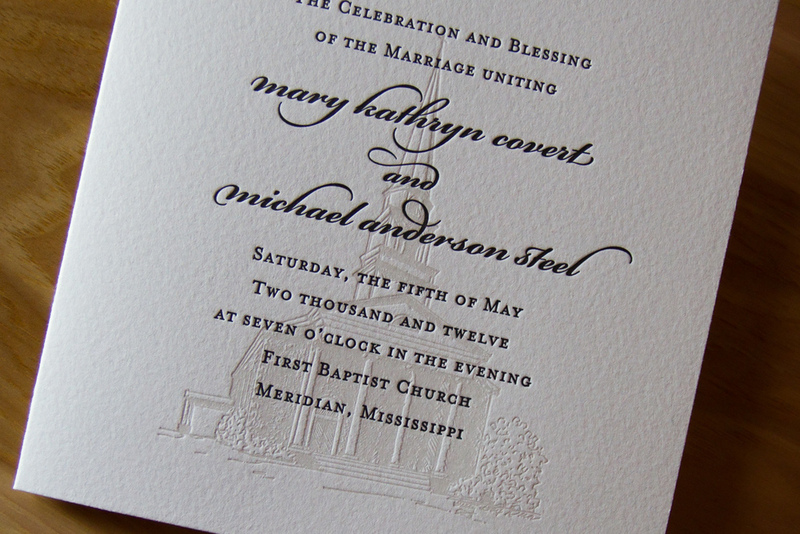 They show the basic info on the front and are designed to match the look of the invitations. 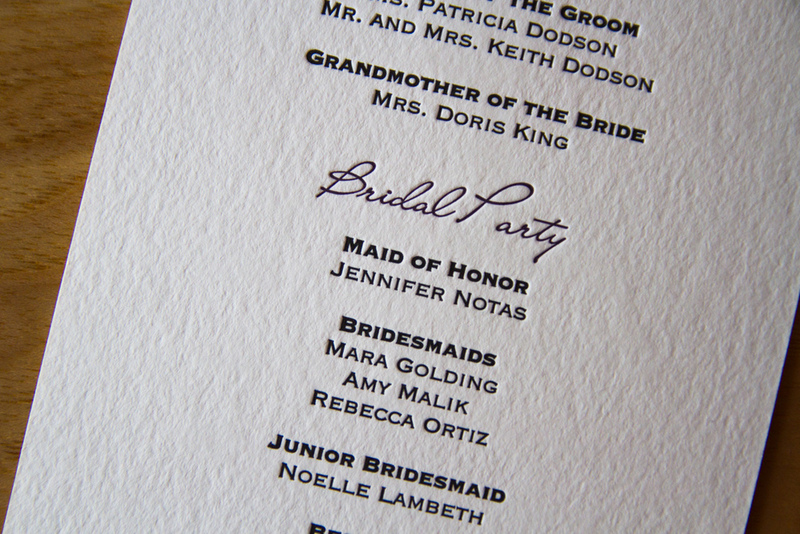 But they're blank inside — they're designed to accommodate an insert, to be printed and then attached via ribbon or glue. But wait, you say. That's all layout stuff. Parklife can help you figure out how best to arrange and present the information, depending on how much text you provide, and that's all very helpful. So ... how much text do you provide? What information goes into a program? What details need to be gathered? To begin with, most simply, a program is a schedule of events. It gives guests a blueprint of what's happening, and a rough timeline of the service. Let's face it, there can be some waiting around on the guests' part. Many will want to get there early to get a good seat, and once they're seated, well, let's hope they haven't pulled out their phones. (No judgement, phone slaves!) But ideally, all they'll have in their hands to read is what was put there when they walked in … the story of your wedding. A program for a wedding is just like a Playbill — it imparts information to the guests/audience, providing details of what they're about to see. How many acts will there be? What are the musical numbers? Who's in the supporting cast, and are there any important cameos to watch out for? Are there any messages from the directors? When writing your program, think of the audience. For most weddings, the guest list is comprised of a wide range of acquaintances, running the gamut from "oldest dearest friend" to "the cousin/childhood playmate whom you haven't seen in years" to "husband of a woman who works with your dad." You write the program so that it addresses everyone, so each guest can follow along regardless of how well they know the couple. Are there any religious or cultural traditions included in the ceremony? What music is used? Are the readings from the Bible, or are they from poems and song lyrics? Apache Wedding Prayer or a passage from The Velveteen Rabbit? And who are all those guys standing up there with the bride and groom? Siblings? Soccer teammates? Sorority sisters and frat brothers? Co-workers? All of the above? Listing the wedding party in the program is not only a way to honor and thank those participants, but it's also thoughtful information to provide to the guests. In the interest of making your little wedding-world a smaller, friendlier, more connected place, it also provides more information for guests to chat and interact during the reception or after-party. ("Oh, you're the best man. Nice to meet you. Did you go to Brown with Adam? I went there, too; class of 2010! What dorm were you in freshman year?") It's all about inclusion of your guests, and consideration of them as an audience. Except it's not just an audience — it's a collection of the people closest to you, to your spouse-to-be, and to your families — it's one big mash-up of "This Is Your Life." Some other elements that can be included: a passage or quote which is meaningful to the couple can really set the tone of the ceremony (above, a line of scripture is paired with a sprig of lavender, carrying through the colors and motif of the wedding). 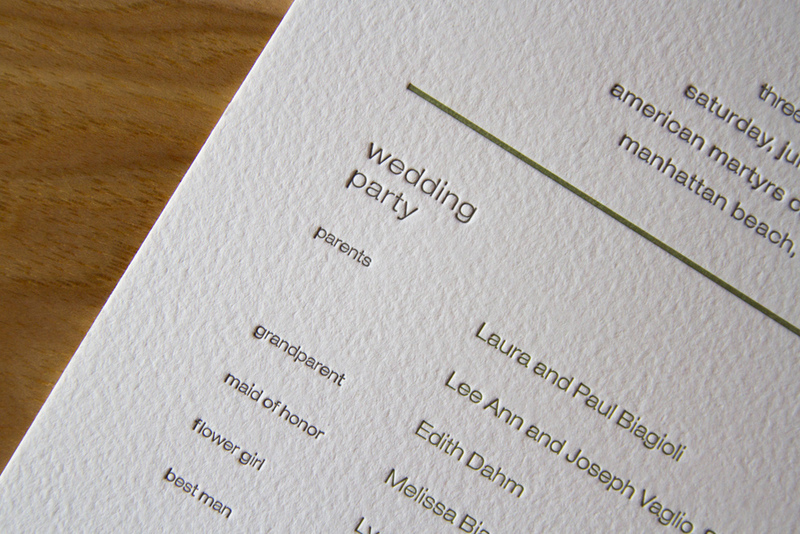 Another extra: if the couple has a new address, the program can be a great place to share it officially with their guests — either on the back, or as a note at the end. 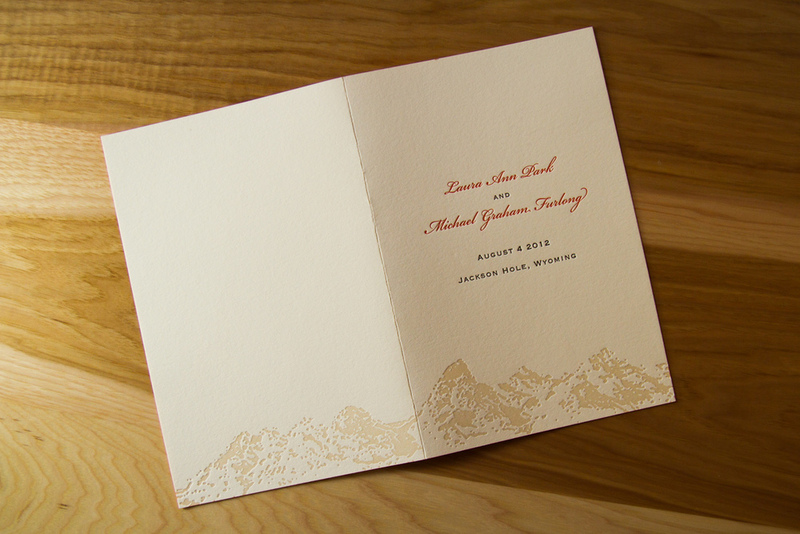 And finally, the wedding program is the perfect vehicle to share a little note of thanks to family and friends. 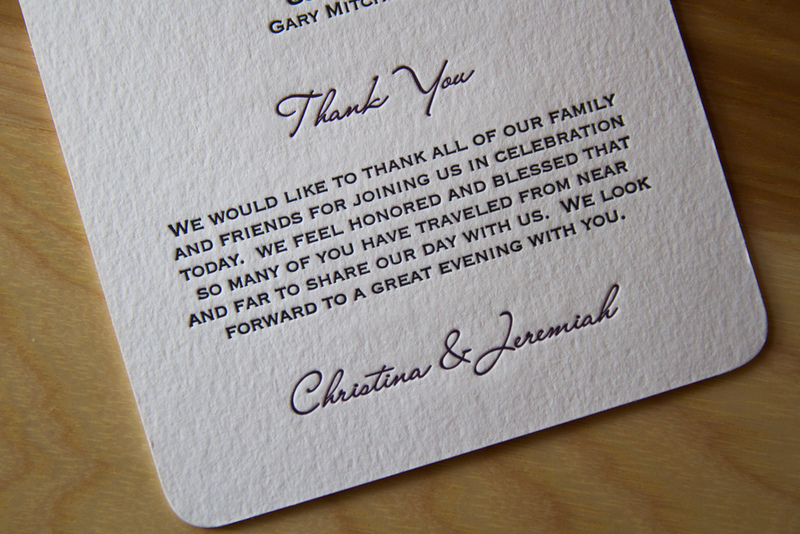 Whether brief or long, formal or chatty, a heartfelt message from the couple is the perfect conclusion to a program, and it is always a gracious sentiment to include. Posted in wedding invitations and tagged with programs, flat program, 4-panel folded program, program cover. June 19, 2014 by Sarah Arneson.